When I first started carrying, the popular joke was that one would have a drawer full of holsters at some point. Well, it’s true. You change carry guns, you change style of dress, you gain weight, you lose weight - all of this does affect your mode of carry. Also, your primary carry firearm may not be right for certain situations, and you have to switch guns. Thus, as I’ve been over before, holster selection is important. As is variety. One of the first things people usually think when they hear “outside the waistband” in terms of holsters is that it is an open carry holster. 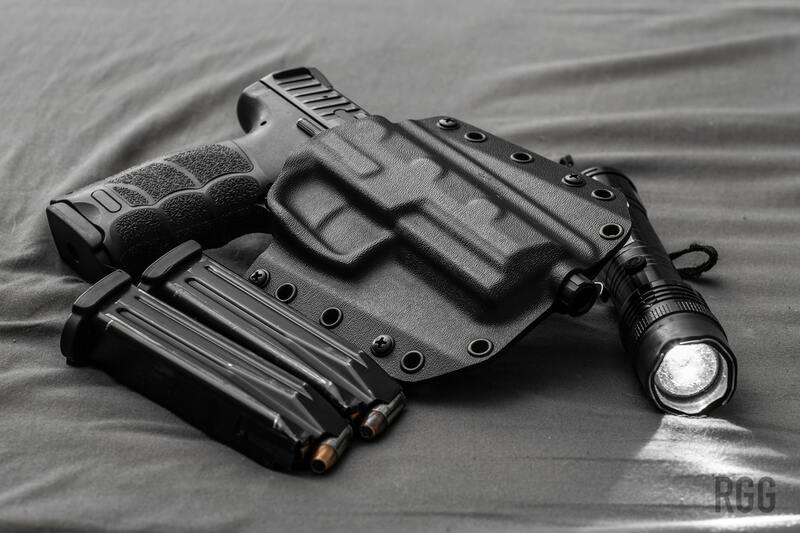 While yes, by definition you probably have an OWB holster if you are openly carrying, but just having an OWB holster doesn’t necessarily mean you are openly carrying. The holster, and your firearm, sit outside the waistband, as opposed to inside. Whether it’s carried openly or not is entirely dependent on your mode of dress, of course. You can conceal with an OWB holster. My chosen method is to keep it simple, I wear a shirt that’s a size up from what I normally wear. Either a T-shirt or something akin to a work shirt such as a 5.11 shirt does the job for me. Basically, look for something that hangs a little loose. And of course, don’t forget a sturdy belt. As the blog has grown, I’ve been establishing relationships with companies and people throughout the industry. Which is what gun blogs do, basically. In a pleasant surprise, I was recently approached by Bravo Concealment to check out and evaluate some of their offerings. Obviously full disclosure, the products are sent at no cost to myself for testing and evaluation. So recently, the fine folk at Bravo sent over their BCA (Bravo Concealment Adaptive) OWB holster for my Heckler and Koch VP9. The holster itself is a simple affair. 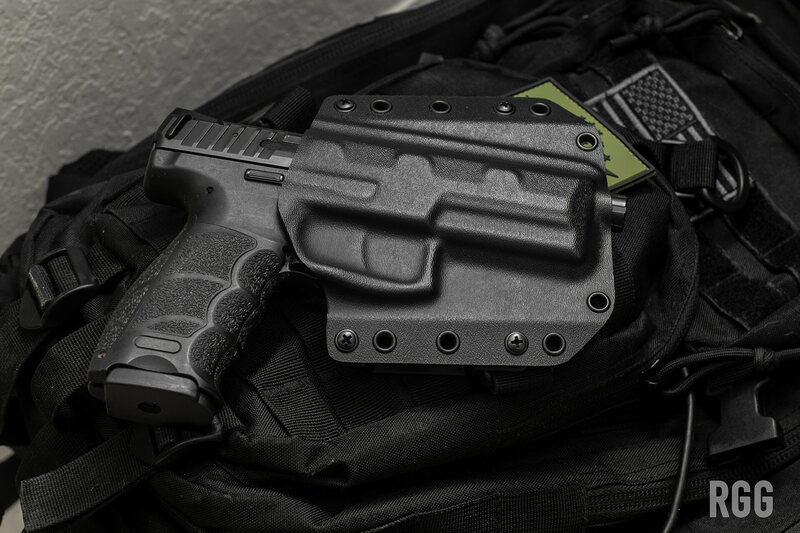 Made of a quality thickness of Kydex, the BCA features a 10 degree cant (the angle by which the firearm sits in the holster) for better concealment, along with some solid 1.5-inch belt loops which feel really robust to me. These are solid loops with no clasp or clip, so you know this holster isn’t going anywhere. Retention is solid, with authoritative action required to draw your firearm. You should be gripping the gun with authority anyways, so this isn’t a problem. Additionally there’s ample clearance between the holster and your firearm’s grip for a more positive draw, and as an added bonus, all edges are rounded, so you’re not stabbing yourself as you move around. Conveniently enough, the holster itself is curved to fit most body types.The “Adaptive” part is where this really stands out. You can swap the belt loops for belt clips, and convert this OWB holster into an IWB holster as needed. Nice. In addition, you can specify with Bravo if your chosen sidearm has a weapon-mounted light or not. They have the capability to fit for most common lights such as the Streamlight TLR-1 and Surefire X300. It’s one thing to fiddle around with a holster in the confines of my home. It’s another thing entirely to strap it on, and go out into the world. So, in the interests of science, I figured I’d commit to taking the Bravo out for a spin, for a month, to make a real-world judgement on the product. As I noted earlier, my preferred and pretty much only carry method over the past few years was inside-the-waistband. While with the quality holsters I settled on, I had no issues with IWB, I found that in certain instances, it did prove slightly uncomfortable, i.e. during the sweltering summers in South Florida. Sweat, chafing, and “holster stank” became part of my reality. But, as they say, the gun isn’t required to be comfortable, it’s supposed to be comforting. So, switching up to a different mode of carry was an interesting experience to say the least. The first thing I noticed after putting on my VP9 with the BCA holster was that I felt that the gun seemed like it was “out there”. It was that feeling of “oh my god everyone knows I have a gun” all over again. For about five minutes. I spot-checked myself in the mirror - again, mode of dress - and continued on my way. Another factor that came into play was markedly increased comfort. As the holster keeps the firearm outside the waistband and clothes, there’s not much in the way of skin-to-firearm contact going on. I’ll surmise a fringe benefit in the swamp-weather of South Florida is that this means less sweat channeling down the holster and causing potential corrosion problems down the line. The little things, you know. Moving about with the BCA proved comfortable and convenient. With the right mode of dress, I saw no obvious hints of printing. Printing isn’t necessarily a crime (check your local laws!) but I do like to keep to the mantra of “concealed is concealed”. Also at a run, I felt no discomfort, nor did I feel the gun would fly out of the holster. While driving, the BCA proved to be more comfortable, and more importantly, more accessible than an IWB setup. IWB setups are obviously meant for deep concealment, which the tradeoff being your firearm may take some more manipulation to draw in certain situations, especially driving. Beyond the scope of this article, of course, is dealing with a self-defense situation while driving, but suffice to say, having your firearm more accessible does grant you an advantage. For long drives, I was totally comfortable. Of course, there were some challenges. Bowling, for example. In a deep-concealment setup, your firearm generally is riding lower in your pants. Thus when you lean to chuck the ball down the alley, your gun probably won’t print as severely. Now, with an OWB setup, I felt the gun was riding a little higher, and that there was an added danger of printing momentarily when bowling. Of course, I wear dark colors so momentary printing isn’t as much of a big deal as I’m making it out to be. Your mileage may vary. I will say though from a bowling standpoint, the comfort helped. I got a few extra strikes. Maybe it isn’t the holster, but if Bravo wants to fine-tune their marketing to the bowling segment, why not? Another interesting challenge was with, of course, the bathroom. With a deep-concealment IWB setup, the holster kind of “hangs” in your pants, and no one is the wiser really. With an OWB setup, the holster hangs, but it does tend to shimmy your belt out of it’s loops, and there’s an increased chance of the set up falling out and off the belt. Without getting too descriptive, my advice would be (for guys of course) when using a urinal, make sure your shirt on your gun side rides a little lower, and you can kind of use your elbow to steady the gun. When you’re deciding to use the throne for a good BM and a half-hour of flicking through your phone, you can manipulate your belt a little to have your gun rest on your leg. Again, your mileage may vary. Figure it out I guess. I did. The most mundane challenge, of course, is mode of dress. While the BCA is super-comfortable, I don’t consider it a deep-concealment holster. By the very nature, your firearm is more exposed. So you gotta dress around it. For guys, it’s no big deal. I dress loose anyways, so it wasn’t a huge stretch to use the BCA as my everyday carry holster. I’ll definitely recommend the Bravo Concealment BCA OWB holster setup. 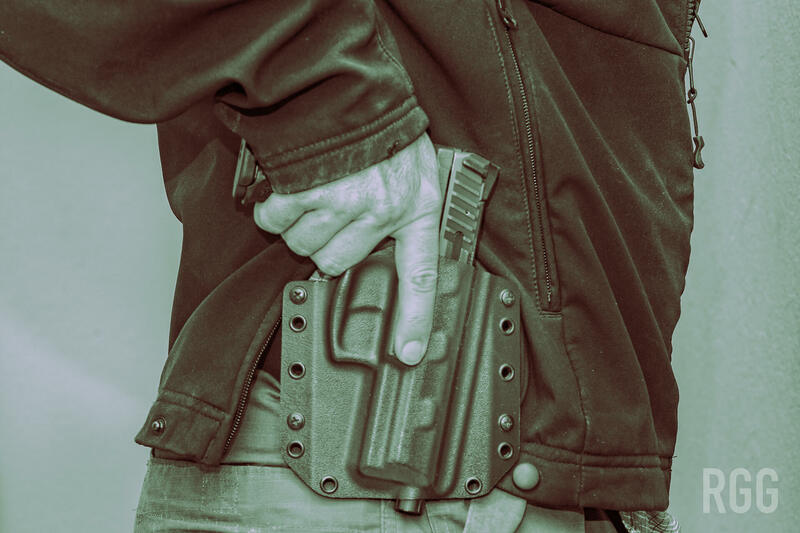 It’s super-comfortable, versatile, and by it’s very nature, makes your firearm a touch more accessible, which could grant you a decisive advantage in a self-defense situation.